Plum Island, part of Suffolk County, is a small island with many controversies and a rich history of its own. Most of that live on Long Island have never heard these stories and would probably shock us to an extent. There has also been a lot if important research done on Plum Island that have prevented foreign animal diseases from reach our soil before it was too late. 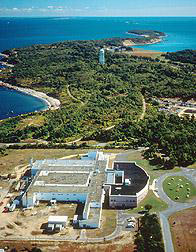 The earliest controversy on Plum Island dates back to when the research facility opened in 1954. 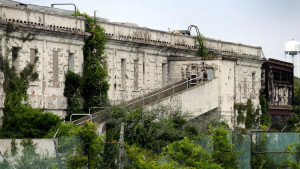 The position of Director of the facility had twice been offered and rejected by Dr. Eric Traub, a former Nazi who worked directly under SS Heinrich Himmler. Traub was a active member of Camp Sigfried and though he didn’t take the job, he was still involved in extensive research on the island. There have been some outlandish rumors about Plum Island such as the origin go the “Montauk Monster, a creature spawned in the lab had escaped into the sea” and “alien experiments” were taking place (www.cbsnews.com). The more debated and convincing happenings on Plum Island come from accounts in Michael Carroll’s highly criticized 2004 book Lab 257 named after one of the key research labs. The biggest claim was that Lyme Disease in this country had entered through an outbreak from ticks being studied Plum Island. To back this up he points to the fact that there are more cases of Lyme Disease reported in Eastern Long Island than anywhere else in the world. One response to Carroll’s claims came from Lyme Disease Expert at Yale University Durland Fish who said “He should stop making these things up. It just scares people.” All experts and former employees have denied Carroll’s claims. One livestock disease that has been studied extensively on Plum Island for years is Foot and Mouth Disease. It affects the feet and mouth of the infected animal and when it affects livestock, they are no longer safe to eat and must be put down. It is a disease that is also contagious from one animal to the next. 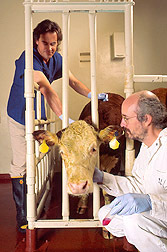 The effects of an outbreak would be devastating to our economy as seen in Europe in 2001 where “the slaughter of millions of animals and the loss of billions of dollars to the economy” occurred (www.cbsnews.com). From 1978-1983, three outbreaks of this disease on the island have been acknowledged but in recent years, a vaccine to the disease was discovered through research on Plum Island. Today, Plum Island has served its purpose for the Department of Homeland Security. While it is currently not being used for any further research, future plans include all work done there to move to a new and much safer Manhattan, Kansas facility. It is a slow move but will happen at some point in our lifetime. With all that is going on in our country at the moment, it appears to have slipped to the back of the minds of those deciding where to budget our money. For the island itself, no longer in the government’s hands, its is been decided to market it for sale, but not without opposition with those who think it should be transformed into a wildlife sanctuary. 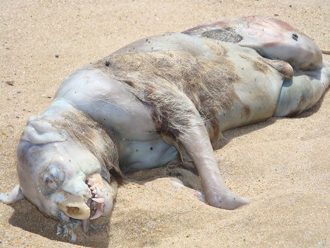 This photo of the “Montauk Monster” was taken by Christina Pampalone. Photo received on July 31, 2008.